I’m so sad to tell you that Floyd Jones, a longtime ACLU-WA donor and one of the dearest men you could ever meet, passed away this morning. You will recall that we honored him at this year’s Bill of Rights Dinner, and he received our William O Douglas lifetime achievement award in 2014. I met Floyd and his late wife Delores Jones more than 35 years ago when I was first hired as Executive Director here – and they quickly became my good friends and stalwart supporters. Floyd was born into a family of sharecroppers in Missouri, and he never forgot where he came from when he became a successful stockbroker. He wanted a world with fewer Americans behind bars and more black and brown Americans on a path towards their American dream. 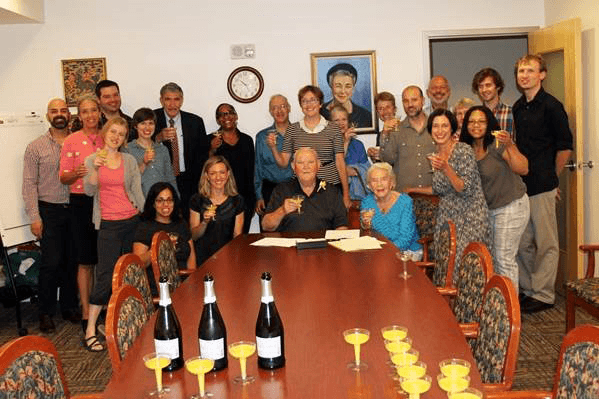 This photo is from a celebration with staff, board members with Floyd and Alene Moris at Horizon House toasting his intention to give the ACLU a $10 Million endowed Floyd and Delores Fund for Transformational Justice. Back in the 1980s, Floyd helped Alan Rabinowitz and me start ACLU-WA’s endowment fund. Floyd then led the way in supporting the ACLU’s nationwide campaign, Leading Freedom Forward, to strengthen ACLU affiliates in states where civil liberties offenses were most egregious like Mississippi, Texas and Florida. When a ballot measure to legalize marijuana was hatched in the ACLU-WA offices, Floyd made one of the first big gifts to the New Approach Washington campaign. And the ACLU is just one of the recipients of Floyd’s generosity. He has supported Union Gospel Mission, the University of Washington, theater, the arts, and progressive political campaigns. Floyd said that philanthropy is “sweetness for the soul” and that his life was a dream come true. Floyd and his son Steve Jones have been ACLU-WA’s trusted investment advisors, superbly guiding and supporting the ACLU-WA for decades. Floyd is survived by son Steve and daughter Laura Knudson who share their parents strong support of social justice and civil liberties.